But then in early April, just before CS5 was launched, Apple made some changes to their SDK license restricting the technologies that developers can use for their products, including Adobe Flash software… So without Flash-derived apps being approved in Apple’s App Store, would that mean the end of Adobe’s new magazine publishing initiative on Apple devices? 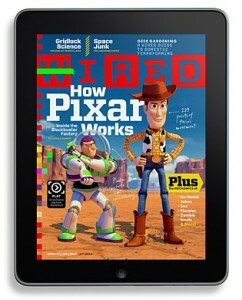 Created with InDesign® CS5 and additional Adobe® publishing technologies, the WIRED Reader is designed to revolutionize the magazine reading experience and allows readers to immerse themselves in magazine content like never before. This Digital Publishing Solution showcases how Adobe is enabling magazine and other publishers to deliver groundbreaking experiences across tablets, smartphones and other devices. Soon, the company plans to deliver software on Adobe Labs that will help publishers to transform InDesign CS5 layouts into compelling applications like WIRED Reader. Because this digital magazine solution integrates tightly with Creative Suite® 5, pub­lishers can expect to leverage their existing workflow investments and designer skills. Adobe is pursuing a multiplatform development strategy that will include Objective-C for the iPad and the Adobe AIR® runtime for the desktop and other mobile platforms. Adobe AIR is a cross–platform solution for building applications based on Adobe Flash technology. AIR 2 and Flash Player 10.1 software will deliver high performance on mobile screens and allow publishers to create engaging, standout experiences for a wide variety of devices (Android™, Windows, Linux), as well as leverage the industry-standard advertising platform built with Flash technologies. I believe Adobe will use a generated meta-language output from InDesign or Flash and compile it in either objective-C for the iPad/iPhone or SWF/Air for the web/Android. That way they fully comply to the Apple SDK as they will natively compile in objective-C and still be cross-platform. Fantastic work by Adobe. Thanks for the article. What are the Top 5 New Features in Adobe Lightroom 3? Where Is Acrobat in the Adobe CS5 Trials?